Paindane Beach Resort is the ultimate family getaway to your own spot in paradise. A vehicle with Diff-Lock or 4x4 is required to reach the resort, as the last 30-km is a sandy track. The resort is 500 km north of Maputo and 30 km south of Inhambane, nestled amongst plantations of coconut palms and miles of unspoilt white beaches. The resort is set on high sand dunes overlooking the fantastic Paindane reef, offering breath-taking views over the sea. Lighthouse Reef, which protrudes north approximately 800 meters parallel to the beach forms a natural bay, which is protected from the destruction of powerful ocean currents and waves, a unique water sport paradise. Paindane bay is home to a coral garden acclaimed to be one of the finest on the East African coast. The soft and hard coral boasts an array of colors that must be witnessed to believed. The abundance of hundreds of species of tropical fish that adorn this coral makes this spot unique and a must for all snorkelers and divers. Deep sea, rock, surf and fly fishing off the lighthouse reef is unrivalled on this coastline. An abundance of Kingfish, Cuta, Natal Snoek, Wahoo, Dorado, Tuna and many other pelagic species roam the reef. Ski boat enthusiasts enjoy the safe launch at Paindane. Once you have launched your vessel you sail directly into the backline and into deep blue waters of the Mozambique Channel - no surf to content with. Those who' are not into water activities can enjoy long walks along the sun bleached beaches, shell hunting, swimming in warm tropical waters, tanning in the basking sun or sipping an ice cold beer in the beach bar. Accommodation at Paindane consists of 4, 6 and 8 bed chalets high on the dune overlooking the spectacular bay and reef. The four-bed chalets are the old Greek style houses and consist of one bedroom, a lounge with bunk beds, a separate kitchen and a bathroom with hot and cold running water. Paindane also offers 5 villas that accommodates 8 people consisting of 4 bedrooms of which 2 have double beds, 2 bathrooms, kitchen and a spacious lounge area. This is ideal for a large family or a group. 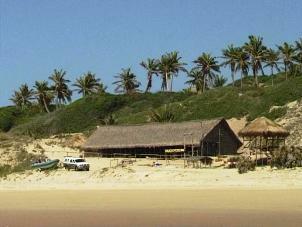 The campsite is also set on the dune overlooking the bay amongst coconut palm trees. As there is limited shade, baracas can be hired that can be utilized as a kitchen or living area. Tents can also be erected inside the baracas. A baraca is a traditional reed and grass shelter and is ideal for relaxing in during the heat of the day. Mozambique is one of the world's best kept scuba diving, spearfishing and big game fishing secrets. With a coastline of over 2500· km, one only has to look at her neighboring exotic dive destinations such as Mauritius, The Comoros and the Maldives to understand what lies beneath the warm Indian ocean - the most pristine and virgin reefs in the world. Sea Blue Diving Safari’s offer you the entire infrastructure and all facilities required to make 'Sport Scuba Diving' and Mozambique the dive destination of the millennium. 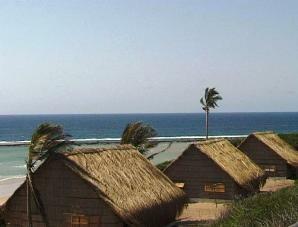 The scuba Centre offers accommodation, in thatched bungalows, which have 2, 3 or 4 beds per room. The kitchen and dining room is fully equipped to whip up a gourmet’s meal and is adjacent to a friendly bar that provides ice-cold beers and soft drinks. Scuba diving at its best, with world famous reefs such as Manta, Kingfish, Lighthouse and Jangamo all close by. Dive with the graceful Manta Rays, or take a ride on a 15-meter Whale Shark - play amongst schools of Dolphin. Although Sea Blue's specialty is scuba diving, they also offer snorkeling with Dolphins, game fishing, deep-sea fly-fishing and spearfishing.